Meet Alyssa, Diana, and Alyssa (again!) 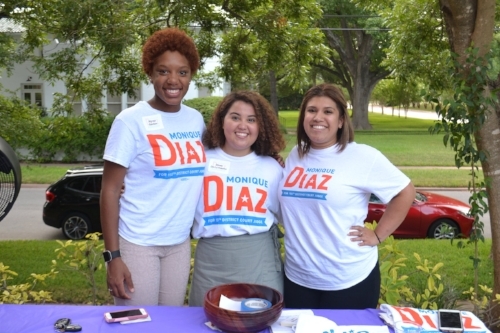 -- three of our six campaign interns. In the past week, our team has worked around the clock: hosting 2 fundraisers, participating in 2 phone banks, attending 1 training, and still coming in for their regular office hours. They’re joining us at the office later today to make personal calls to friends and family to ask for support as we approach our midnight deadline -- so I’ve got to make one last ask too. With your help, in addition to winning in November, we’ll train an army of young people in campaigning and politics. Investing in this campaign means investing in the next generation of attorneys, organizers, and leaders, and investing in our community's future. It’s crunch time. Every single donation counts. Every dollar helps us fuel this grassroots campaign. Can you give now, in any amount, to push us forward? We couldn’t do this without them -- and we can’t do this without you. We're less than 50 people away from our donor count goal. If you’re able to, here’s the link to make a donation.